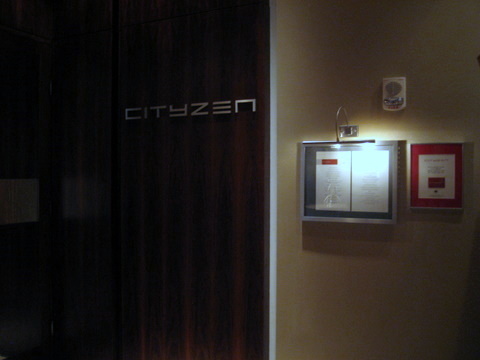 Situated just south of the Washington Mall is CityZen, a restaurant whose very name suggests what the restaurant aspires to be, an isle of calm for those who walk the halls of power in our nation's capital. 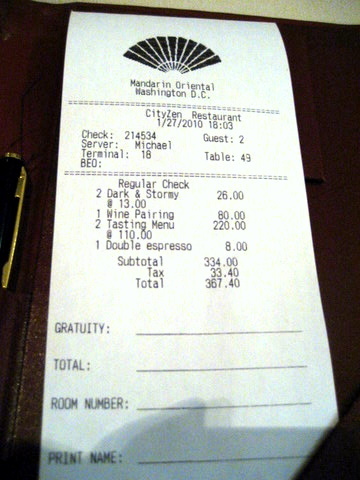 The restaurant is located in the Mandarin Oriental which offers a clear view of the Capitol building from the front door. 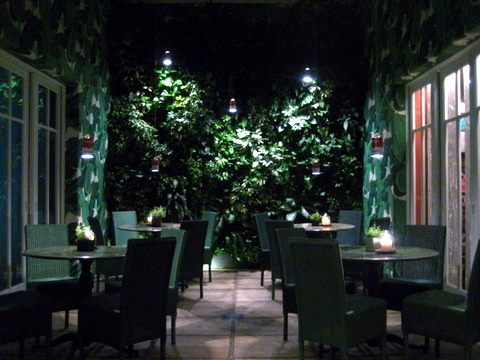 The restaurant opens with a bar back lit with flames licking up a clear glass wall. The dining room seems almost cavernous with high ceilings and thick stone pillars, more foreboding than tranquil in my opinion. 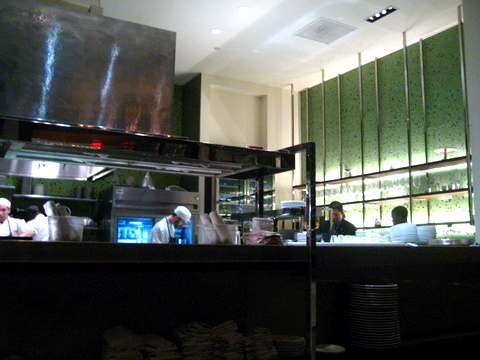 While the restaurant does not have a chef's table, the kitchen is in plain view. 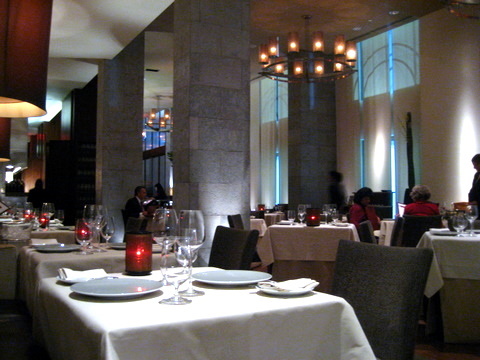 For diners who want to be close to the action, ask for table 49 when making a reservation. The kitchen is lead by Chef Eric Ziebold, who was at The French Laundry for 8 years prior to opening CityZen in the Mandarin Oriental. 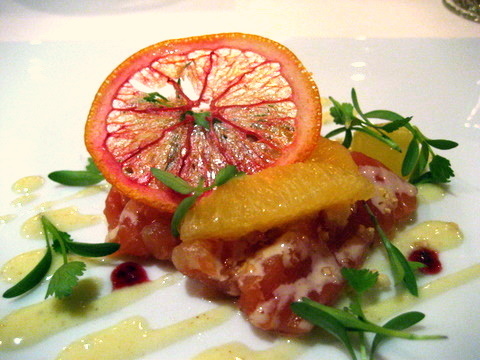 As of last year, he is also the executive chef at the DC Mandarin Oriental's more casual restaurant Sou'Wester. First up was a mushroom fritter, the crispy texture of the toasted mushrooms contrasted sharply with the chewy gnocchi like interior while the dollop of sauce accentuated the natural earthiness of the mushrooms. 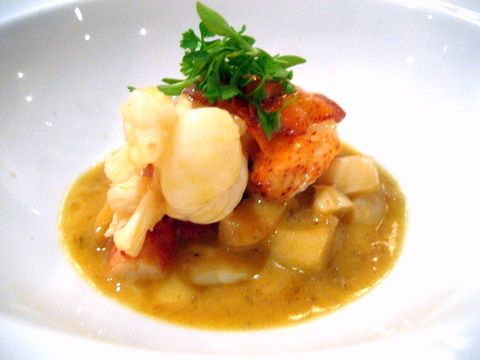 The shrimp broth was similar to lobster bisque, elements of buttery richness combined with the pungency of shellfish coral. 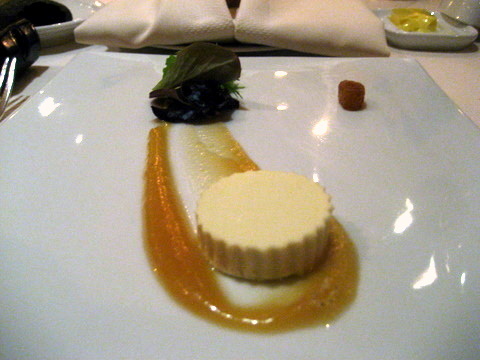 The flan itself reminded me of Japanese egg custard, exuding a meaty aroma instead of the slightly sweet characteristic flavor of cauliflower. 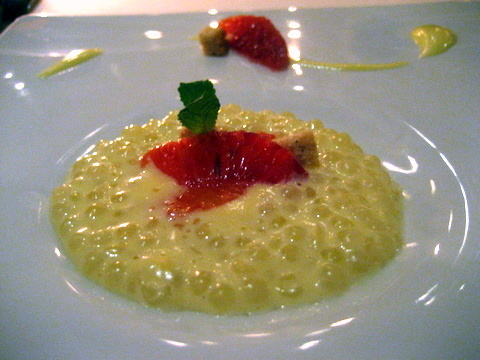 The lighter flavors of the citrus and roe were instrumental in tempering the heavier flavor of the flan. Aside from a lack of caramelization I couldn't really tell the difference between this and a seared preparation. 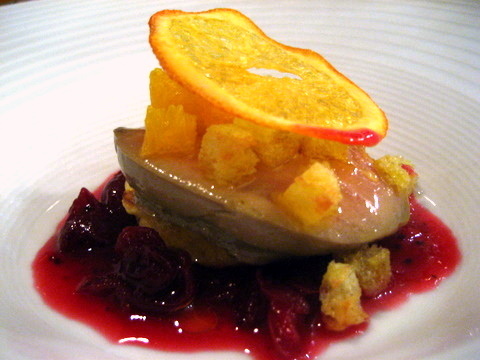 The foie was pure semi-liquid fat the abundant use of sour fruit blunted the richness but added a bitter tang on the finish. Sweet and crisp just how good lobster is supposed to be. 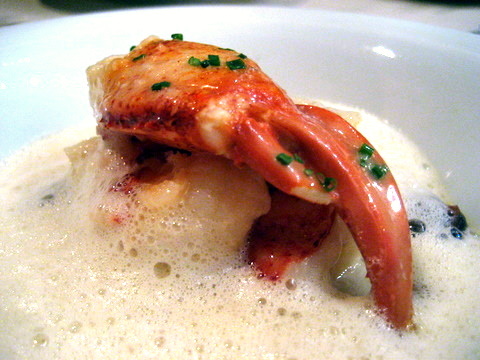 The toasty flavor of the pine nuts complimented the lobster nicely and the poaching helped take some of the floral sweetness off the currants, letting the buttery salinity of the bisque and lobster come to the fore. Another expertly and traditionally dressed course. 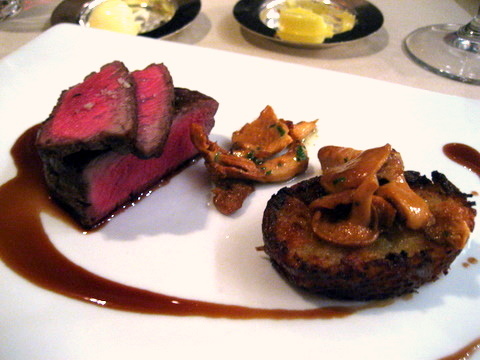 The steak was strong enough to stand on its own but the pungent woodiness of the chanterelles and the cheesy zip of the potato were quite welcome. 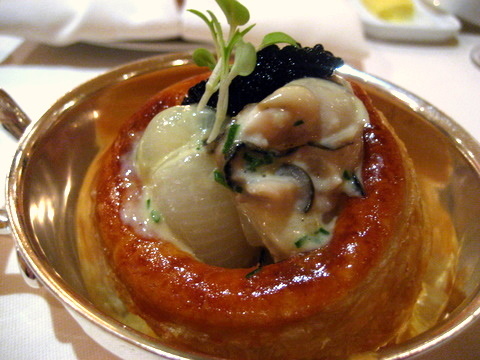 Ironically the most memorable part of the dish was the side of CityZen's signature Parker House Rolls, the warm bite-sized buttered rolls reminiscent of a savory Hawaiian bread. 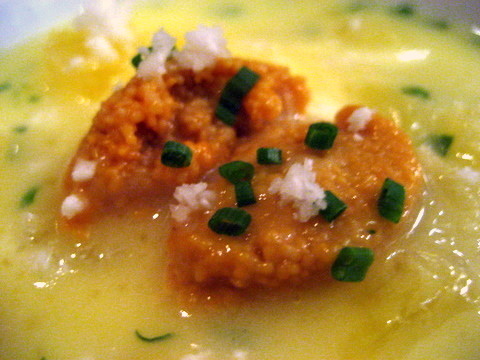 The cheese course turned out to be the most distinctive dish of the evening. 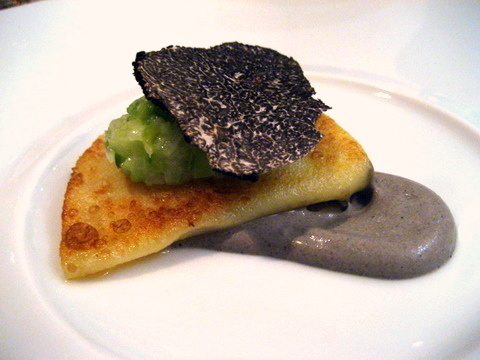 The gentle flavor of the Gabietou, took on an almost toasty dimension when served as a crepe while the truffle added an element of luxury and depth. I'd liken this dessert to a grown up ice cream sundae. Pear desserts can be a bit dicey, coming out too syrupy for my tastes. However as a chiboust, the freshness of the pear was apparent sans the overwhelming sweetness, complimenting the rich burnt sugar and whiskey notes of the ice cream. 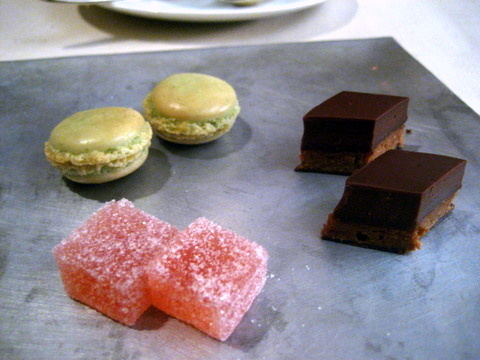 The meal closed with a very good example of three very classic mignardises. 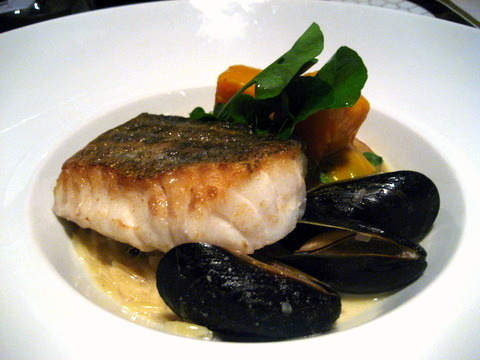 Keller's influence is clear in Chef Ziebold's technically superb, classically constructed dishes. I just wish the kitchen took some more risk with the menu; instead I left this meal feeling the menu was straight out of a textbook. They definitely have the skills now if they just had the creativity to match. 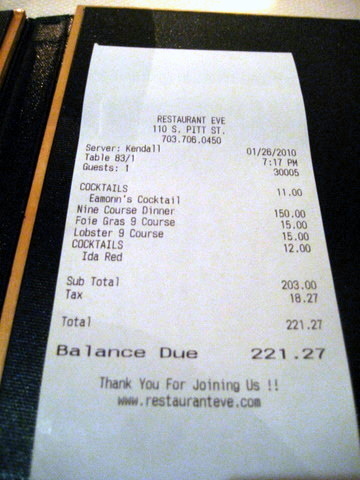 During our first meal in DC our waitress mentioned some of her favorite restaurants including one Restaurant Eve about one mile away from my hotel in Alexandria. 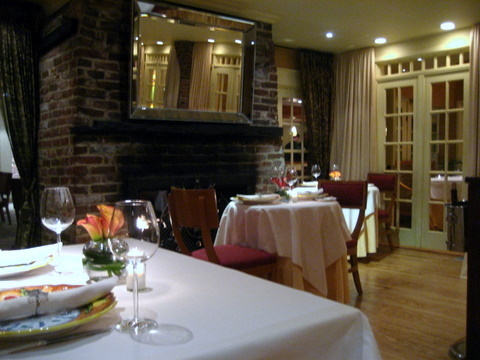 The restaurant is owned by Cathal Armstrong, a self-taught chef from Dublin Ireland along with his wife Meshelle. The Armstrongs are pretty much the culinary first family of Alexandria. Along with Restaurant Eve, named after the couple's first child, they also own Eamonn's, a Dublin style fish and chip joint named after their son. 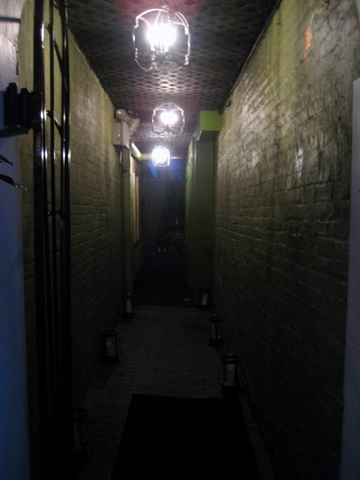 Co-located with Eamonn's is PX an upscale semi-secret speakeasy with partner/sommelier Todd Thrasher. If that wasn't enough the couple also lead the charge to reopen The Majestic rustic American cafe that has been part of Alexandria since 1932. Back to Restaurant Eve, the exterior is almost completely nondescript except for a small sign and I actually walked right past the restaurant while looking for it initially. 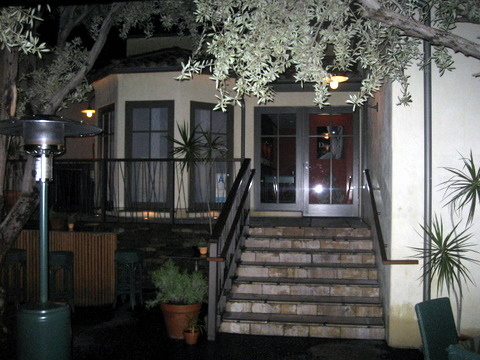 The interior is divided into three distinct parts, a lounge, bistro, and tasting room. 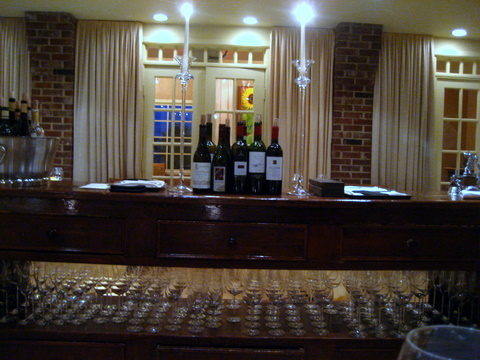 The lounge and bistro offer a more casual dining experience while the tasting room offers 5,7, and 9 course menus. 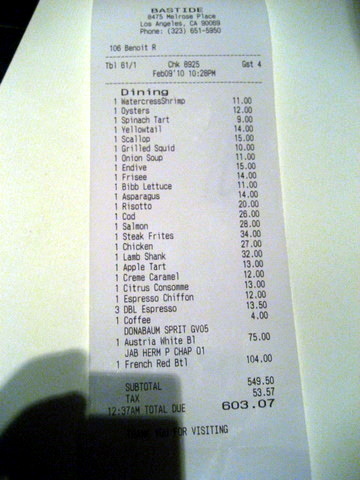 I originally tried to get a reservation for Saturday or Sunday but the dining room was booked the whole night through. Finally on a whim I called Tuesday and was able to get a seat. 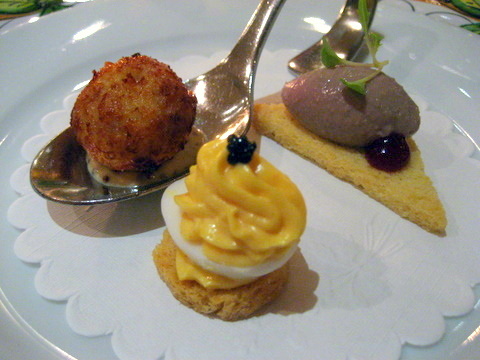 First up was a trio of canapes. 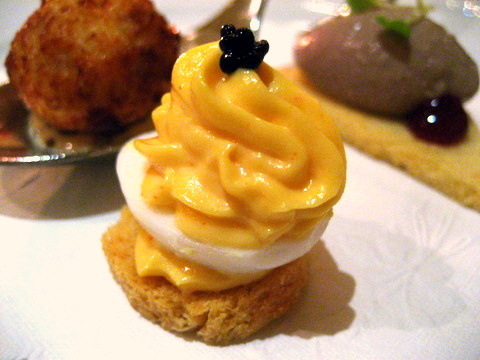 Quail Egg with Caviar - A nice study in contrast between the dense egg white and the almost whipped airy yolk. 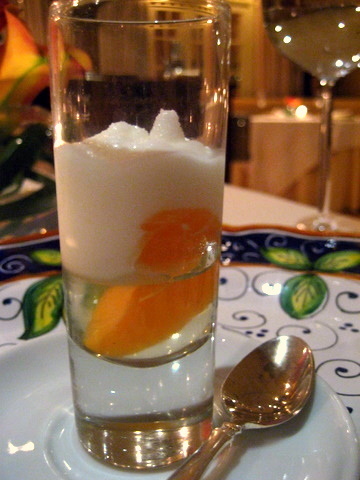 The caviar helps to add accents of salinity to the unseasoned egg. 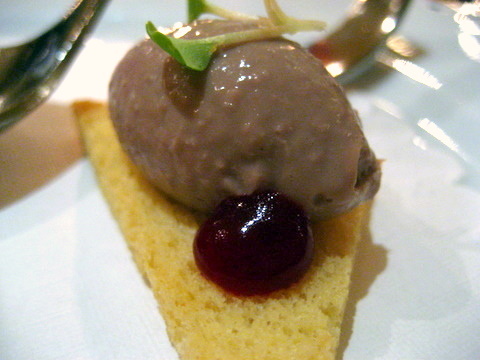 Rabbit Liver Mousse with Cranberry Gelée - Easily the most pungent liver I have had in recent memory and perhaps ever, though the cranberry helped temper the blistering gaminess somewhat. Ham and Cheese Fritter - Like breakfast all rolled into one bite, biting through the crunchy shell yields a bounty of molten cheese and savory ham. On its own the Heart of Palm had a firm texture and root-like sweetness. The cilantro was integral in drawing the vegetal characters of the heart out while the lime added a nice citrus counterbalance. 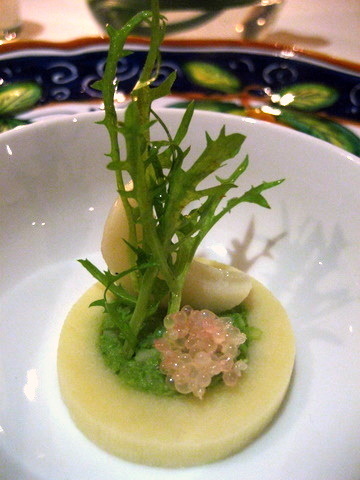 This was my first experience with Australian Finger Lime, the vesicles have a caviar-like appearance and the burst with a crisp pop and sudden rush of flavor. I know its a bit early to be having palate cleansers but when they are this good I don't mind. The frozen Satsuma screams for attention with a tooth numbing chill and impossibly dense texture. 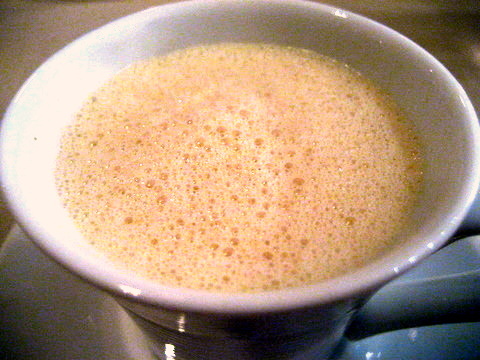 Add to this the subtle flavor of champagne and a sweet herbaceous foam and the result is absolutely superb. 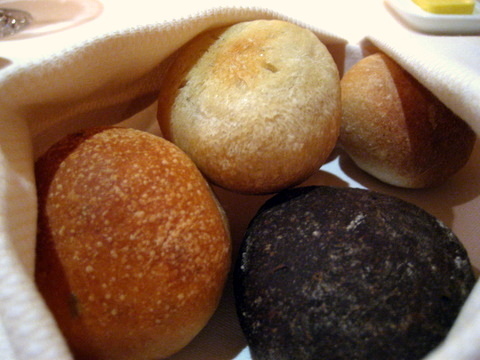 All three breads came piping hot with a nice crisp exterior and moist center. Especially delicious with the Kerrygold butter, my new favorite butter, though I had to restrain myself for fear of filling up on bread. Absolutely superb, the fish was exceedingly fresh with a rich fleshy texture and delicate brine; spot on with the multifaceted acidity from the citrus marinade and the spicy sweetness of the candied ginger. I'd have devoured the whole trout if it were prepared this way. 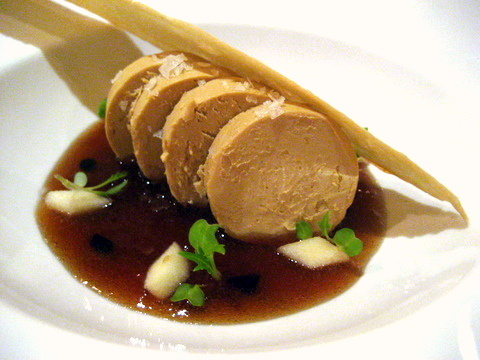 Next up was the "Root Beer," actually terrine of foie gras with root beer, apple diamonds, and a milk tuile. Nothing subtle about this course, the terrine itself was superb buttery soft and intensely rich. The root beer adds a general sweetness but I doubt I would have recognized it as root beer had I not been forewarned. Quite enjoyable though preferably in small amounts. Like the previous course, the lobster is an upgrade from the standard 9-course but I consider the extra $15 money well spent for the spectacularly succulent sweet lobster tail poached in more of that delicious Kerrygold butter. A bit on the sweet side when taken with the parsnips but so delicious on its own that I hardly touched the root vegetable anyway. I mentioned that I was looking forward to this course all night which drew a smile from my waitress. She then told me of the difficulty getting diners to try sweetbreads. One time when she forced a customer to try the sweetbreads and he agreed as long as she called it something else when she brought it to the table. 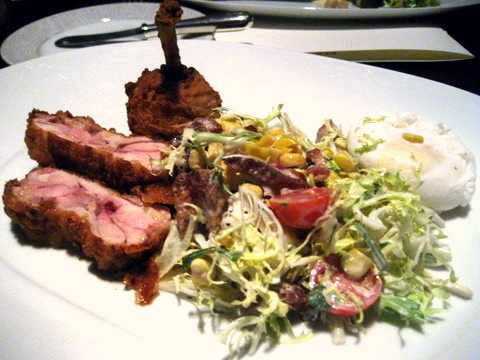 The waitress presented the sweetbreads as fried chicken which turned out to be a better fit than I first expected. The initial crispiness gives way to a dense pillowy interior. 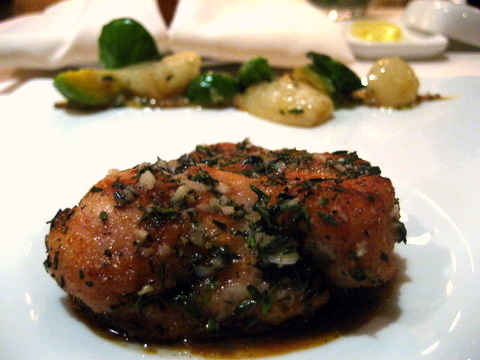 The liberal sprinkling of rosemary and bitterness from the sprouts help counter the offaly weight of the sweetbreads. The deep redness of the meat had me expecting a strong gaminess but this turned out to be quite mild, almost more like a rare steak then deer. 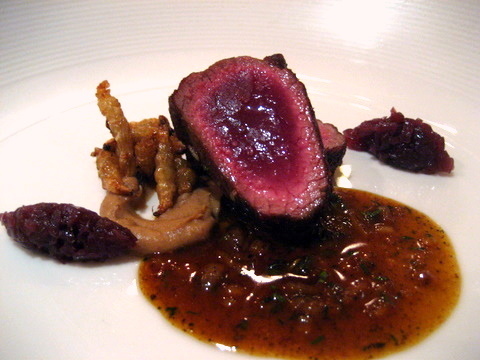 As with any good piece of meat, the venison was better enjoyed alone, letting its natural flavor come to the fore. I find the absolute best cheese courses are those where the kitchen does something different from the traditional cheese plate and this was no exception. The dense Bavarian Creme was substantially milder than pure cheese, reminiscent of a sweet custard tinged with the essence of blue cheese and a great lead in to dessert. 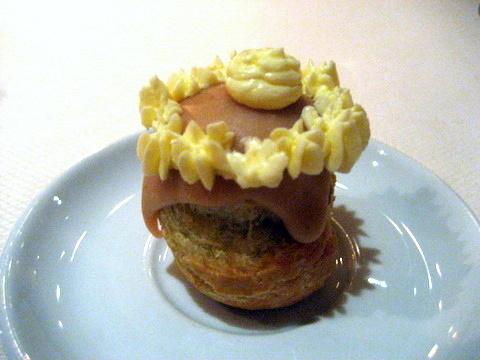 Apparently the name of this pastry comes from the fact it looks like the habit worn by French nuns. Regardless of the name, it was delicious, particularly the interplay between the spicy bitter filling and the creamy sweet topping. This dessert reminded me of toothpaste, slightly chalky and minty with the blood orange adding jarring flashes of intense citrus. On the menu this was listed as a chocolate soufflé but the chef decided to do something special for me. 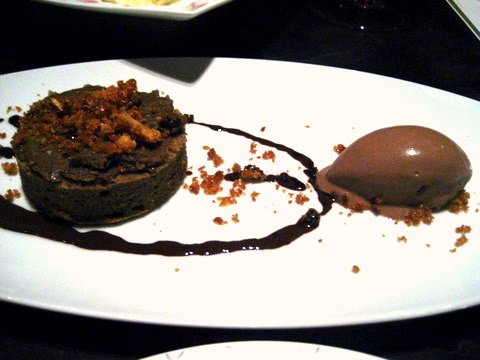 This was a study of chocolate in a myriad of types and textures. 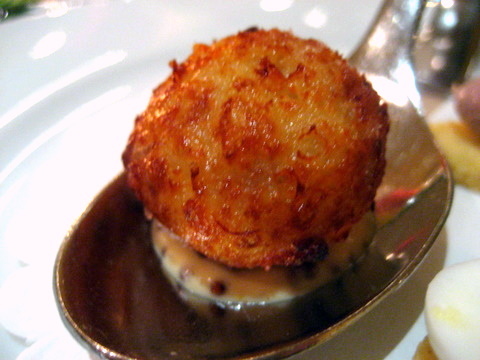 Most were fairly classic but he one standout was the white chocolate beignet with risotto filling. 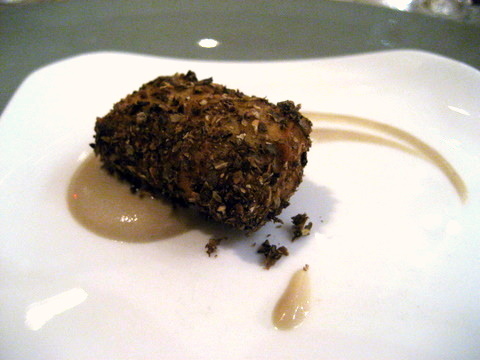 Restaurant Eve easily lived up to and surpassed my expectations. 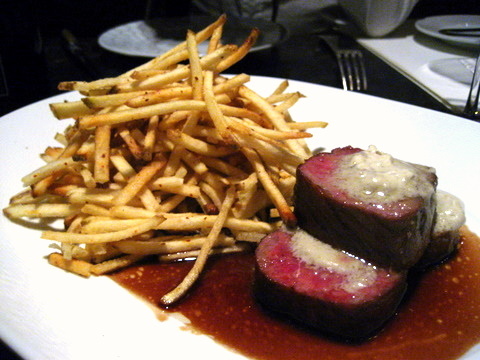 For someone evidently proud of his Irish heritage, Chef Armstrong's grasp of French cuisine is second to none. 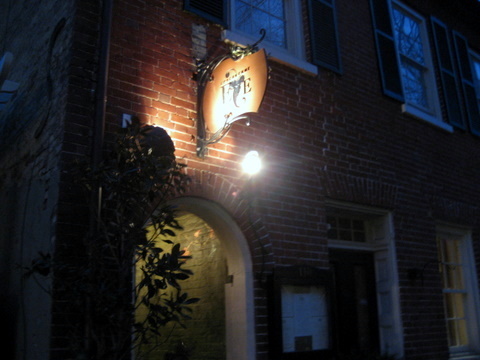 I think Restaurant Eve would be a strong contender in DC and easily dominates the pack in Alexandria. As with Central, time constraints severely limited my time at Restaurant Eve and the staff had me racing through the 9-course in just under two hours. If I am ever in the area again I'd like to revisit the tasting room under less rushed circumstances and give the menu the consideration it deserves. Giraud, Lefebvre, Manzke, and Shoemaker. Most restaurants with such a revolving door of chefs would be destined for the dust bin of history but somehow Bastide has risen above that. 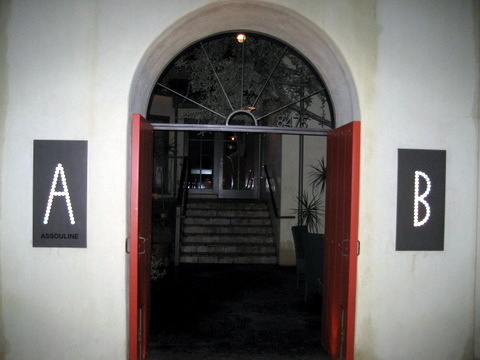 Each incarnation of the restaurant seemingly opens to great anticipation and typically strong critical acclaim. At the same time the chefs go onto bigger and better things after a stint at Bastide despite typically leaving under less than ideal circumstances. Perhaps the thinking goes anybody who can deal with the mercurial Ptyka can handle anything a kitchen throws at them. 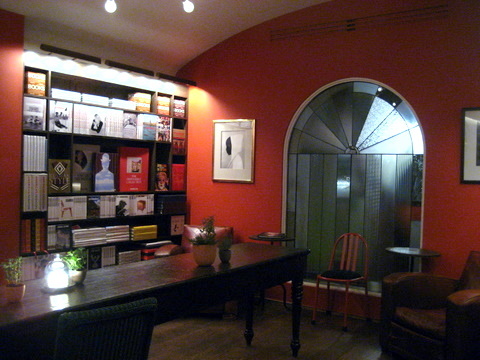 Enter Chef Joseph Mahon who reopened Bastide in December 2009 as a "bookstore bistro," offering books by French publisher Assouline (notice the illuminated "A"). 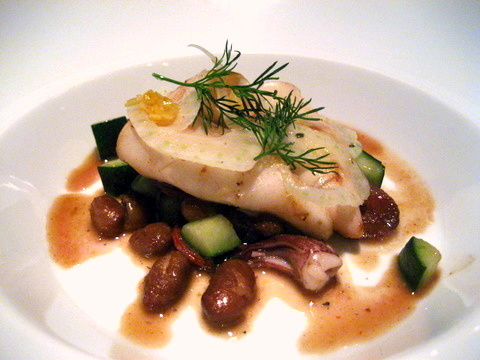 After a breaking in period I was happy to see dinner service return to Bastide. 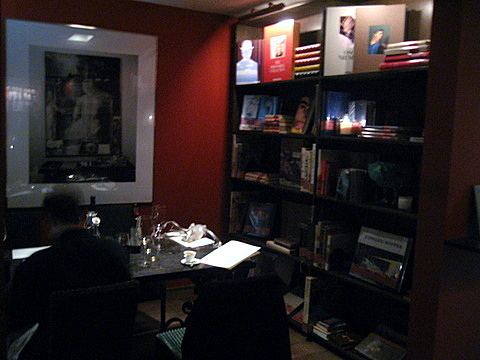 Much of the decor and structure remain the same but the shelves laden with books give the restaurant a familiar inviting feel, like dinner at a close friend's house. 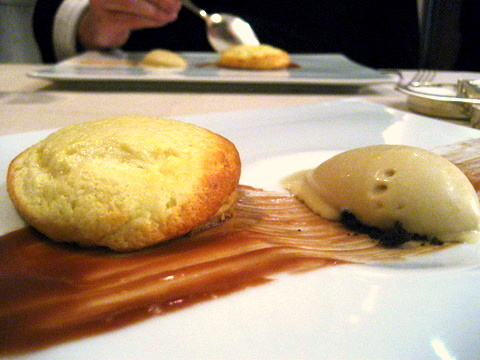 The old Bastide had arguably the best bread service I ever tasted. 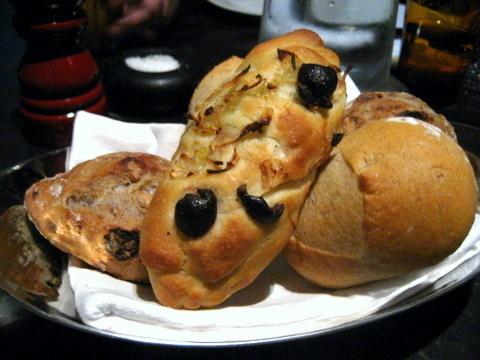 While the bread wasn't up to the level of my first visit, the selections were quite good particularly the olive bread. The restaurant doesn't have a tasting menu yet so we just ordered one of everything on the menu. Unfortunately since we came near closing time they had run out of the oysters by then. The star of this course was easily the interaction between the warm grilled shrimp and toasted pine nuts. I normally enjoy the crisp refreshing character of watercress but found the custard lacked the same level of intensity, though it did add a dense textural contrast. Listening to the tart crumble underneath my fork I knew this was going to be good and I wasn't disappointed. 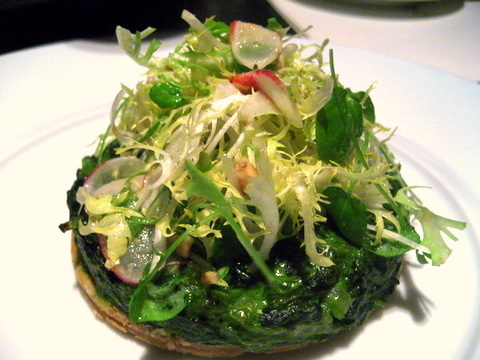 The buttery tart and combined with the spinach and pancetta are reminiscent of the classic Quiche Lorraine. Seems like squid has become the hot new item the last few months with consistently good results. 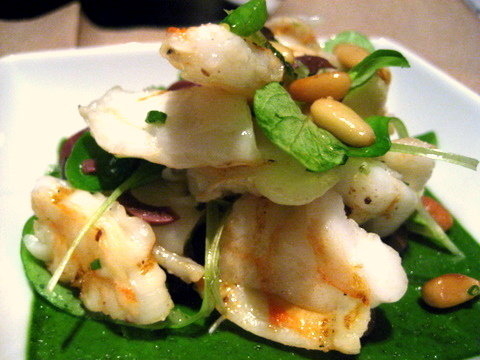 Bastide's offering has the makings of a superb grilled squid, snappy texture and briny sapor, with the chorizo adding lingering smoky weight and vegetables offering a subtle herbaceousness. The thickness of the scallop allowed for a welcome level of complexity, transitioning from well-done and caramelized at the top to completely raw at the base. 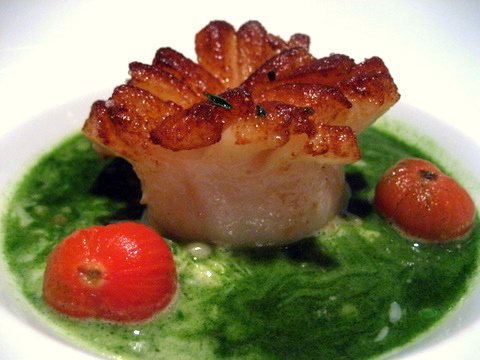 The basil broth provided a strong vegetal to the mix, strong enough to add an interesting wrinkle to the dish but still enjoy the complexity of the scallop itself. 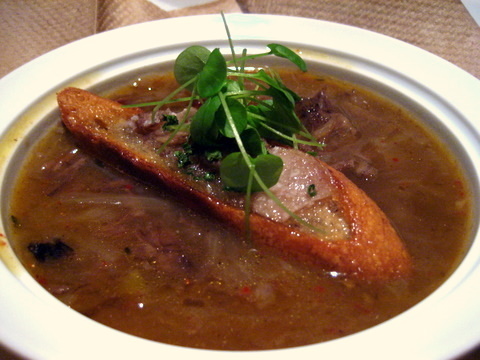 A textbook French Onion Soup with a lingering bite on the finish; the redolent broth was enhanced with a meatiness from the beef while the kidney beans added a welcome starchy body to the soup. I typically like my raw fish neat but the light treatment of the vegetables made them a wonderful companion adding a brisk crunch in contrast to the dense fish. 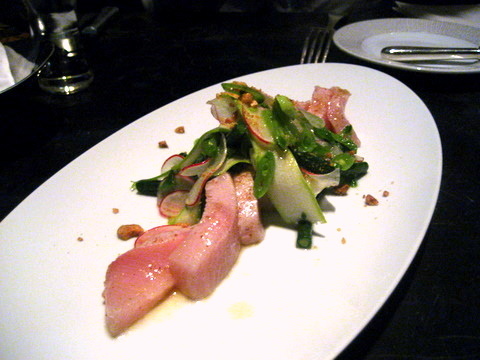 The kicker was the finish, a subtle note of mint, quite a departure from the typical hamachi. 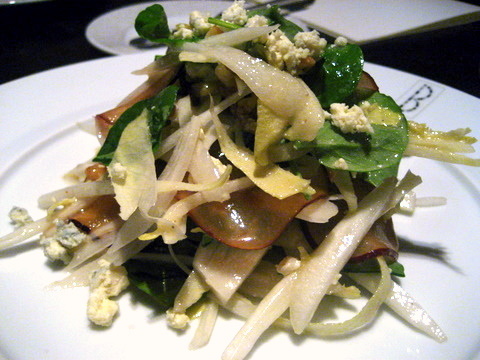 Alone the endive had a tangy depth and lively crispness, but it was the characteristic blue flavor of the Cabrales and tempering sweetness from the plums and honey that made this salad exceptional. 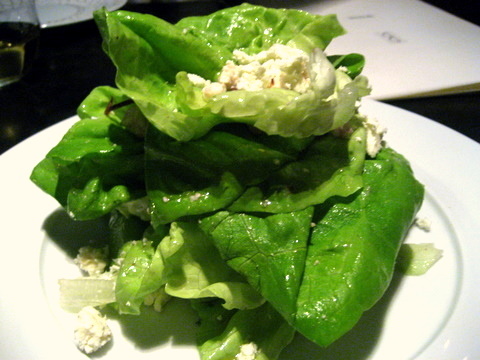 The leafy greens are paired with a mouth-puckering vinaigrette and dry crumbly feta. I found the mix a bit too acrid for my tastes but the rest of the group seemed to like it. Perhaps the most conservative of the evening's salads. 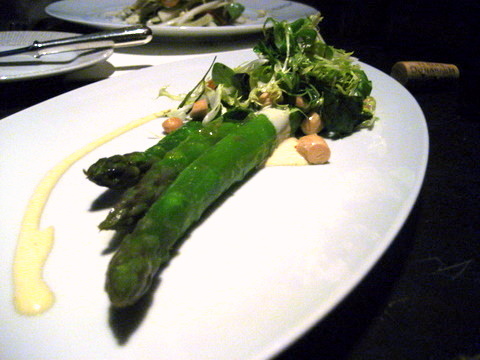 The herb salad and lemon aioli provide nice a distraction though for the most part, the natural essence of the asparagus holds the diner's attention. Salad Lyonnaise is fast becoming like steak tartare to me, consistently delicious but slightly boring so I was happy to see addition of fried chicken to shake things up a bit. Both the salad and the chicken were good in their own right but the combination made this delicious. 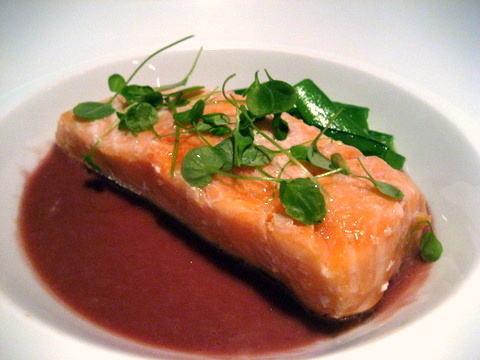 The salmon looked as if it had barely brushed the grill, almost entirely raw throughout the fish displayed a pronounced fishiness that was deftly managed by the port wine sauce. There was actually a bowl of rich potato puree that I forgot to eat until long after I had finished the fish, leaving me to wonder how the two would have been together. Another delicious fish preparation, flaky and tender; delicious on its own or with mussel cream which helped heighten the flavor of the fish. 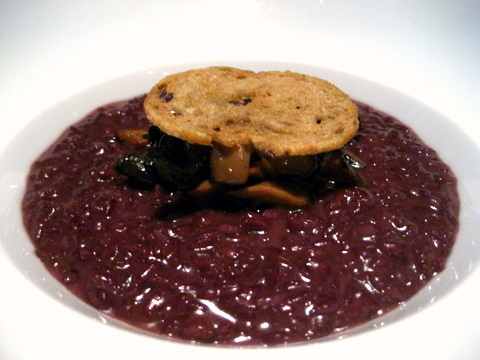 I've never really been too big a fan of red wine risotto, the richness so essential to a good risotto is muted by the astringent red wine. This is my first time having anchovie butter on steak, as expected gives a mackrel-like savoriness to the beef that works exceedingly well with what would have been a solid but unremarkable steak otherwise. A very homey dish, I would expect to see a plate like this at a dinner party hosted by friends. The mustard and chicken were a spot-on combination, but I didn't care for the vegetables. 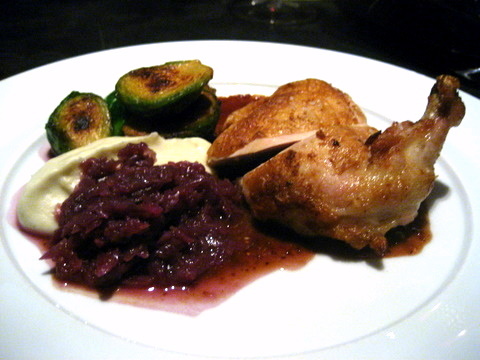 The celery root and Brussels sprouts both had very aggressive flavors and the minimal preparation meant these two sides often dominated the chicken itself. just what you'd expect with a good braised lamb, tender lean meat interspersed with generous marbling and all but falling off the bone. 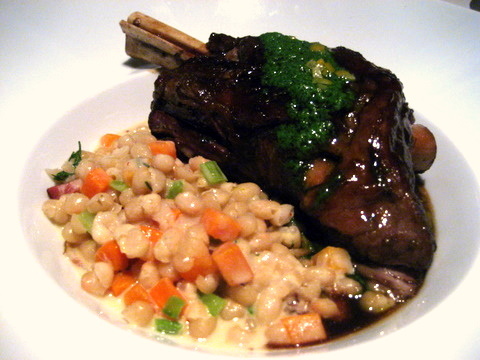 The nuttiness of the arugula works well to temper the heavy gaminess of the shank. We wanted to try all the desserts as well but unfortunately they had run out of the Espresso Bon Bons by the time we got around to dessert. 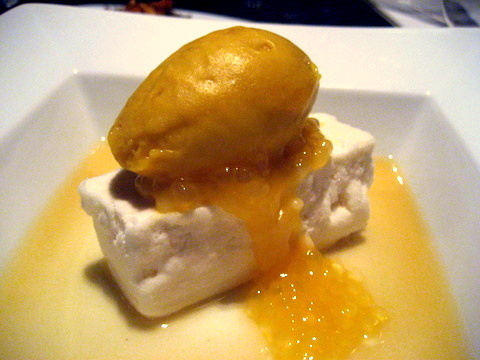 Apparently the restaurant just hired a new pastry chef, Rommel De Leon, whose work I admired at his former home, Rivera. 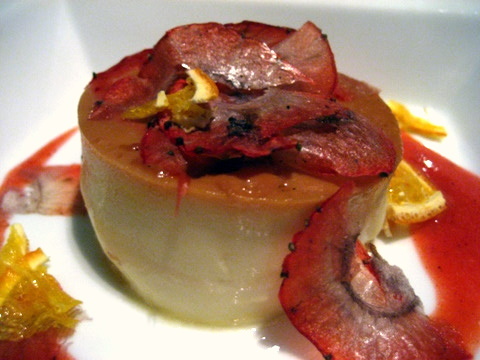 A fairly typical crème caramel, firm and sweet, the dried fruit added a concentrated burst of flavor that broke up the monotony of the custard. Chef De Leon's strength seems to lie with pastries above all else. Both this tart and the pastry desserts I had at Rivera have been simply brilliant. There is something to be said for a chef who can take one of the most basic desserts and turn it into something special. 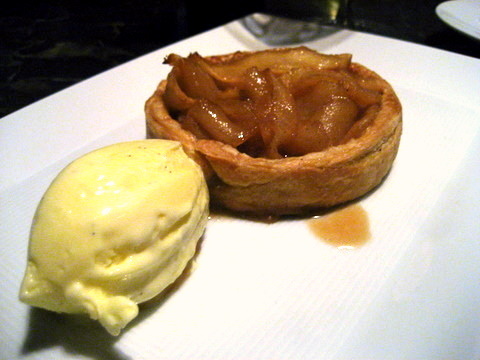 The cooked apple is omnipresent but restrained, helping tie the dish together rather than headlining. The buttery tart is imbued with the subtlest hint of savoriness from the salted caramel and the ice milk resonates with a note of pure vanilla. I tend to favor fruit based desserts over chocolate but every now and then a chocolate course comes by that really impresses. The flavors of chocolate, espresso and toffee complimented one another yet were distinct enough to keep the dessert interesting. 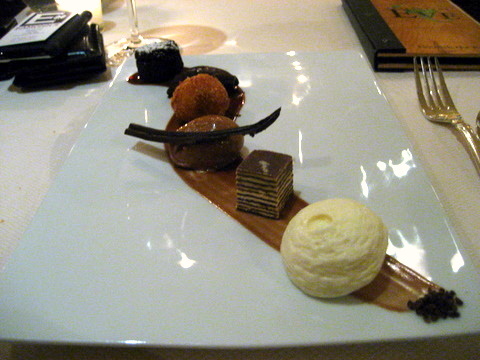 Add to that, the textural interplay of the three elements and you have the makings of a complex and delicious dessert. I wasn't sure what to make of this dessert to start. While I would have liked a bit more textural contrast, I quite enjoyed the contrast between the acidity of the consomme and the blunt sweetness of the mango. The food at Bastide is noticeably different under Chef Mahon, gone is the sense of playfulness and whimsy that characterized previous incarnations of the restaurant. Ironically by espousing a eschewing the avant-garde french cuisine of Bastide's previous masters and embracing a more simplistic menu, Chef Mahon goes a long way to making the restaurant his own. All things considered the restaurant was quite impressive for an opening night or any night for that matter. It remains to be seen if Chef Mahon will in the footsteps of his predecessors or continue to offer his personal brand of classic French cooking.